During the #BETAGeneralAssembly the new Management Board was elected. Let us introduce you to the team that will coordinate the work within BETA Europe for the 2018-2019 business year! The new President is Nick Madzarov. The two Vice-Presidents are: Suzana Pecin and Stefan Zirkovic. The Treasurer is Lina Kalouti. The Secretary General is Kristin Aldag. Read the following introduction to get to know them! The new President of BETA Europe is Nick Madzarov. His studies and work allowed him to considerably improve this international experience, supported by trips to Czech Republic, Israel, Luxembourg and the United States. Returning to Prague, six years ago he began his adventure in BETA, which led him to hold prestigious positions in various MEU editions of Strasbourg, Lisbon, Sofia and Zagreb. But his activity within BETA was not limited to these experiences only: he was also treasurer of BETA e.V., as well as President of BETA Czech Republic and Auditor of BETA France. His passion for travel and culture allows him to boast a vast repertoire of known languages, including Russian, Hebrew, Italian, English, besides his native Czech and Bulgarian. His enthusiasm will certainly be an added value to the coordination team and to the old and new groups that make up the BETA universe. Right next to Nick, we find Stefan, the newly elected Vice President of #BETAEurope. Stefan was trained in Political Science and International Relations, also pursuing an apprenticeship in the S&D political group in the European Parliament, where he worked in the development policy unit and Africa. He has already had experience as coordinator of the Public Relations Team, highlighting the projects and values of BETA with its partners and more. Not only was he head of the fundraising team but he also led the CLOs as part of the Strasbourg team. His spirit of initiative has pushed him beyond BETA, leading him to volunteer in various organizations about youth, sustainable development and education. 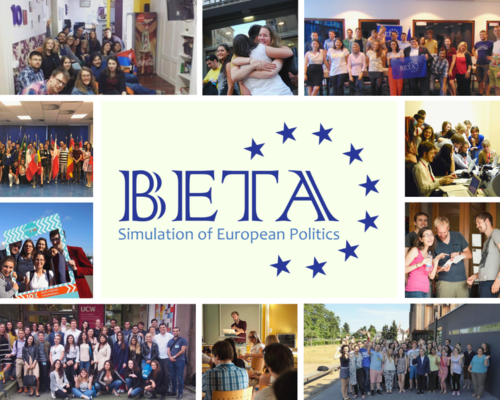 Among its main objectives as vice-president of BETA Europe, there is no doubt, is that of putting young people at the center of the European political debate, offering them new opportunities to participate and to develop the awareness of the role they have in the decision-making process of the EU, through #BETAnetwork and #MEUniverse. Alongside Stefan, there is Suzana. Suzana’s curriculum presents a substantial amount of experience. She studied at the Juristiche Fakultat Heidelberg and Faculte de Droit in Luxemborug. She is a trainee at the Court of Appeal and PhD student at the Faculty of Law in Ljubljana. She has participated in many simulations, e.g. European Law Moot Court Competition, Manfred Lachs Moot Court Competition, both as a participant or coach. Suzana worked for i.e. the Ministry of the Interior as law student and did an internship at the Court of Justice of the EU. While she was an undergraduate student, she was a legal adviser to the president of the University of Ljubljana, a member of the Student Council Faculty of Law in Ljubljana, a delegate of the European Union of Students, Minister for International Cooperation of the University of Ljubljana and External Affairs Secretary at the Mediterranean Network of students. 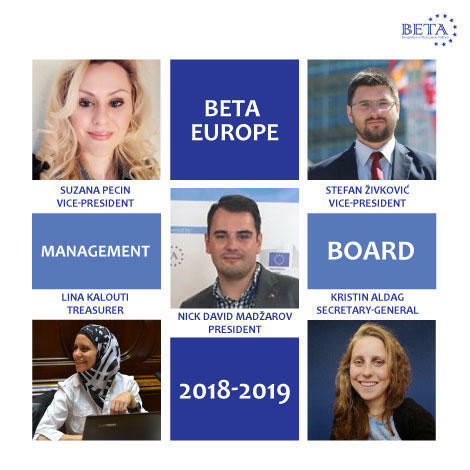 After covering the role of head of legal affair at BETA Europe, she is now elected for the position of the vice-president. Lina is the new treasurer. One of the milestones of Lina’s education is her degree in European Studies at Heinrich Heine University in Dusseldorf. She was able to deepen and strengthen her knowledge by participating in various MEU simulations, increasing support for European integration. Having become a human resources officer, she was soon promoted to head of human resources thanks to her great dedication. Her skills and enthusiasm allowed her to do a fantastic job in coordinating questions for different roles, coordinating the member database, monitoring the payment of registration and membership fees. Lina was instrumental for the General Assembly in Brussels and the Symposium in Prague. Thanks to her experience gained in the management of budget and people, she will surely be an excellent partner for our auditors. Her position as head of human resources and the communication of non-MEU external partners will continue. Kristin is a student of International Relations, specializing in area studies for Europe and Russia. Currently, she studies in Krakow, Poland. She feels proudly European and doesn’t hide that her identity has been simulated by her involvement with BETA. Raised in Germany, she experienced an emotional EVS in Moldova, which as she said, turned the course of her life. She never escape the challenges. Her curiosity pushes her to want to learn and understand, and manages to fill the pleasure of discovery through travel. Her first contact with the BETA world took place in 2017, when she took part in MEU Strasbourg, deciding soon after, to become part of the team. From now on she will be responsible for internal communication and the main contact person for our 12 national BETA branches, in charge of internal communication. They’re ready. And you?